Apple butter is easy to make and so delicious. Add a bit of maple syrup and bourbon and this Maple Roasted Apple Butter with Bourbon is the BEST! It’s Progressive Eats time! You might have noticed that we’re not actually doing a dinner like we did the first year (time; it does fly). We’re simply having each member choose a food in the month of their choice and it’s all about the recipes each of us devise for that food. This month Liz, who is the magic behind the blog ‘That Skinny Chick Can Bake,’ gave us this simple but absolutely delicious theme; it’s all about the apple and they are my favorite fall produce (take that pumpkin!). Growing up I doubt we ever saw anything but Red Delicious Apples at our house so the changing times have been good. Those poor apples have been destroyed in my book and are only pretty to look at; it’s the newer versions that I love. The ones that are not as tart as Granny Smith but still hold together in a pie or other apple treat. Fuji, Jonagold, Honey Crisp and more; I love them all and I especially loved mixing together an assortment for this heavenly concoction. I wanted to make something I look forward to every year but this year I added something new? One guess only and you’re right…surprise, surprise it’s bourbon! This Maple Roasted Apple Butter with Bourbon absolutely lived up to expectations. The pan roasting with maple syrup and bourbon softened and sweetened the apples in an amazing way. The addition of a bit of bourbon does what I expected and is so hard to describe. It definitely elevates the flavor but it’s not like this apple butter tastes like a cocktail for even I would probably turn my nose up at that. There is just something about bourbon that is just divine in baked goods so just fair warning…I’ve no intention of stopping! Maybe it’s time for a cookbook. Boozing It Up – A Guide to Bourbon EVERYTHING! My original intent had been to buy some English Muffins for a photo since that seems to be a likely companion for apple butter but time got the best of me and I decided instead to make a simple quick bread. Oh my. I mean really OH. MY. The slightly spicy Apple Butter sweetened with Maple Syrup and Bourbon was good enough to eat off a spoon but slathered on this bread filled with apple chunks and toasted walnuts was another form of nirvana. I did a comparison and tried one slice with butter and one with apple butter. Can you imagine butter ever being boring? I know…seems impossible but it was true. The Apple Bread and Apple Butter were such a fantastic combination that I’m thinking of making them my holiday gift to friends. And then maybe just keeping it all for myself! (Not really!). I’ll share the bread recipe with you next week; for now just get this made first OK? I did process and can my apple butter in jars but it’s not necessary, you just have to keep it refrigerated. How long before it goes bad? I don’t know, mine has never lasted beyond a couple of weeks! Also, do make sure you visit my friend’s websites after the recipe; they are so talented and have offered up an amazing array of wonderful apple dishes! Heat oven to 400 degrees. Lay apples in single layer on baking tray skin side down. Combine the cider vinegar, lemon juice, maple syrup and bourbon and drizzle over all of the apples. Put the pan into the oven and bake for approximately 30 minutes, basting with the drippings in the pan every 10 minutes. When apples are soft, remove from the oven and turn the oven off. Puree the apples in a food processor or blender. I like them blended pretty well but at least enough that the skin is no longer in identifiable chunks. Put the apples, water, maple syrup. bourbon, granulated sugar, brown sugar, cinnamon, ginger, nutmeg, cloves and salt into a large pan; heat on medium until bubbling. Reduce heat to low, cover and let simmer for 30 minutes, stirring occasionally. If apple butter seems too thick; add a bit more water. Many recipes for apple butter indicate that the apples should be peeled but I prefer not peeling mine. Once the apples are put into a food processor or blender, they should be broken down enough you will never notice the peel but I do recommend this only if you use organic apples. If not using organic it's safer to remove the peels and proceed with the recipe as indicated. Welcome to Progressive Eats, our virtual version of a Progressive Dinner Party. This month’s theme is all about Apples and is hosted by Liz Berg who blogs at That Skinny Chick Can Bake. With Autumn’s arrival, it’s the perfect time to start using fall’s harvest in our menus. We have some great ideas this month to use apples in all sorts of dishes, from Appetizers to Dessert. If you’re unfamiliar with the concept, a progressive dinner involves going from house to house, enjoying a different course at each location. We may share a meal on these pages or sometimes our best recipes for a theme but each month members share new recipes and old favorites and you can hop from blog to blog to check them out. We have a core group of 12 bloggers, but we will always need substitutes and if there is enough interest would consider additional groups. To see our upcoming themes and how you can participate, please check out the schedule at Creative Culinary or contact me for more information. How long did you process the jars? I cannot wait to make this recipe, and give the jars out as christmas gifts! It says it yields 5… is that five 1 pint jars? Thank you so much! Also cannot wait to make the bread again.. Yum! This is so good that I ve already made it three times! And I had to go buy more apples because the apple butter is now gone. It is a vicious cycle and yes, perfect for Thanksgiving brunch. I m sure it would be magical with pumpkin butter, too! I remember having apple butter every summer on our yearly vacations to the North Carolina mountains. It was, through my child’s eyes, just this side of heaven. In all these years, I’ve made gallons of applesauce but never apple butter. Guess what I’m making this weekend? Yep – your apple butter!! I know I should have make a lot more because I’ve given away all but one jar and well, I know that is not enough for me! Luckily it’s easy enough so a do-over is most definitely in my future. Too bad you’re not close; I would give you one! Roasting the apples is brilliant! How awesome must the flavors be! Geez, now I’m wishing I had cooked my applesauce longer and added spices! 😉 Gorgeous as always and I am in love with that adorable spoon! So now you have to do it again…or wait til Thursday when I do pumpkin butter. And then pear butter? I’m on a roll and they are all SO good! Mmm! This is a great combination of flavors. 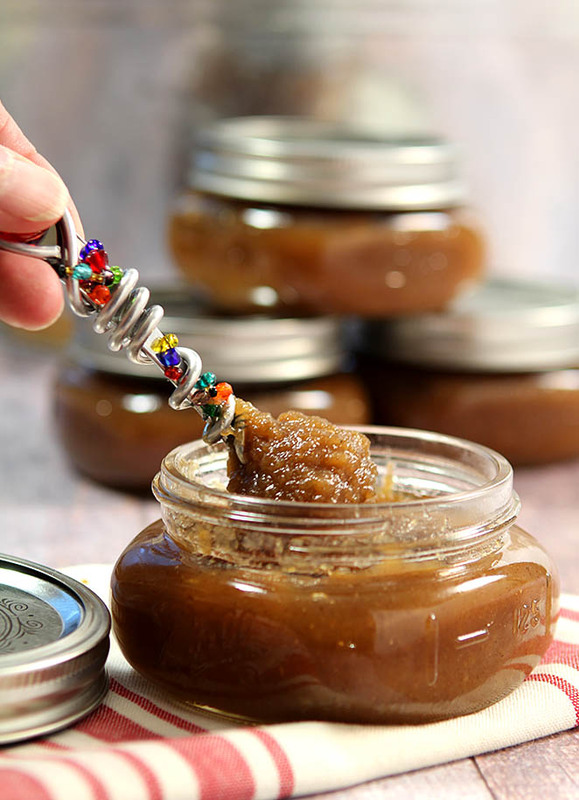 I can think of tons of uses for this great apple butter! I struggled to get beyond eating it off the spoon but it is great with a plain English muffin, on the bread I made and today I’m working on a salad dressing. I’m gonna need some more jars! This stuff is over the top good. How clever you are! Oh I don’t know about clever; I seem to go towards this flavor profile a lot! Probably because it’s just so good huh? 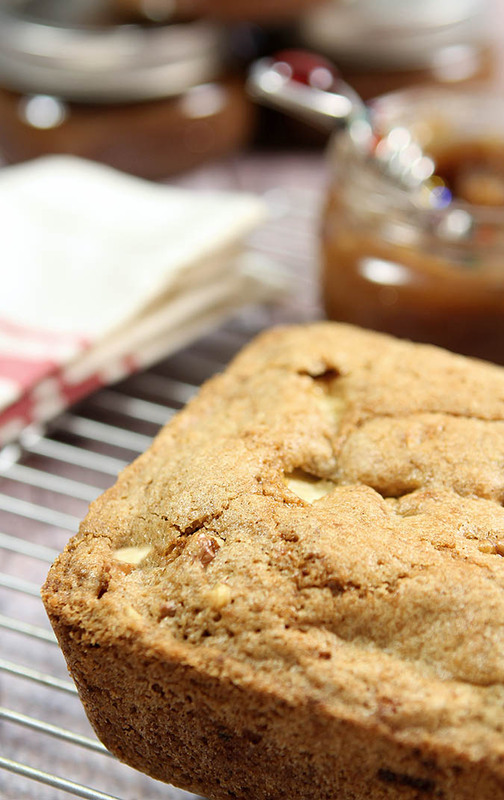 Apple butter is one of my favorite things in life, so I knew I’d love your recipe. But the bourbon sealed the deal. I’m making it and pinning and yumming it to make sure I do this as soon as I return from traveling!! Fabulous!!!! you had me at bourbon! looks great. I love apple butter but I can only imagine what bourbon would taste like in it. So, so good! REALLY GOOD! The thing is it adds something but it’s not really boozy; just a great depth of flavor. If I can taste the bourbon a lot I’ve probably put in too much! I love the additional step of roasting the apples! I bet it intesifies the flavor and also cuts down a bit on cooking time once you get them in the pot. Such a great idea. And now I’d love to see that gorgeous apple bread with a ribbon of this apple butter running through it. And then spread with more apple butter, because I’m not sure there’s ever too much of a good thing when the good thing is concentrated appley goodness! Roasting them with the syrup and bourbon makes a huge difference and it’s easy too so definitely a win win moment! What a fantastic twist on regular apple butter! YUM! Thanks Laura; it’s my favorite. Well all of them I make in the fall are my favorites; the homemade versions are just SO good. Roasted apples with bourbon sounds like heaven to me. You went the next step and made them all prettied up in a butter, but I’m ready to just throw them in a bowl and dive in:)! What a fabulous party! I wish I could partake! I’m all about the apples and adore apple butter but you just took it to a whole other level! You had me at bourbon! This sounds scrumptious. I know my mother would go crazy for it; I’ll have to make her some. Happy Dishing! 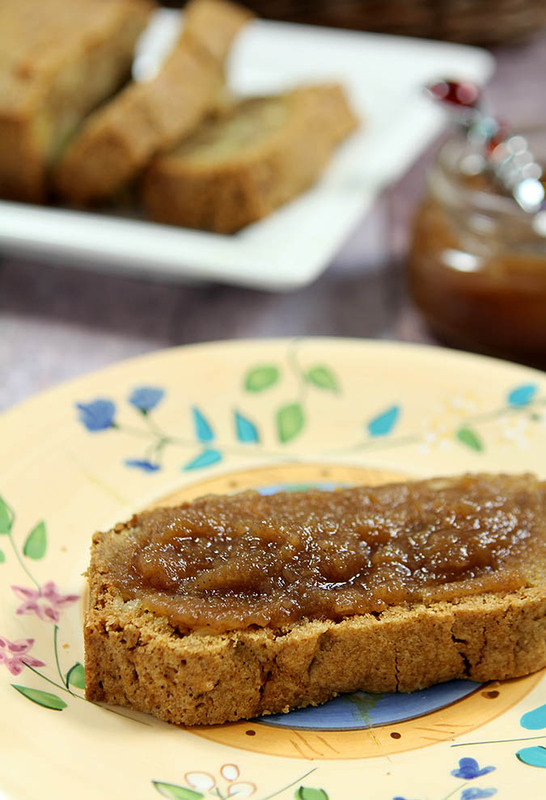 I looooove apple butter and this is such a delicious twist! Bet you can’t eat just one. Spoonful or jar! Yes, it really is that good! I love the idea of roasting the apples in this recipe – this sounds so flavorful! The roasting makes for a nice intense flavor; I can’t imagine doing it any other way now Jeanette. Now I’m yearning for both your boozed up apple butter AND your apple bread! What a magnificent pairing! Gorgeous recipe! I can’t wait to give it a try. How long will this last in the fridge, Barb? There is both vinegar and lemon in the recipe that gives it some protection but I would guess a couple of weeks. I always can mine so have never tested it’s staying power; seriously it will be gone before you have to worry about it if you share a jar or two with friends.